Planting shrubs is the best way to create form and structure in your garden, and working with a selection of different ones, both evergreen and deciduous, and large and small, is the way to create variety too. Getting the balance right, between mass planting and individual specimens, using different heights, and with different foliage types, is the key to creating a garden that looks good all year. We want a garden that is both calm and interesting. There are some basic ideas we can follow, that will help us get it right, and create the garden of our dreams, so here are some tips on selecting and placing shrubs in your garden. When we first discover the amazing variety of shrubs available to us, all with interesting features, the temptation is to want them all. Since our gardens are limited in size, it is very easy to end up with a collection of many individual plants – ‘one of this, one of that’. This is fine if you want to grow many different things and become a collector, your garden will inevitably look a little chaotic and disorganized. The choice is yours, but if you want a beautiful garden, resist that temptation and limit your choices to plants that work for structure and appearance, and be willing to use plants in groups, and repeated them around the garden. Knowing how many of each plant to buy can be tricky, but there is a simple way to approach it, that works most of the time. Basically, the larger the shrub, the less likely it is you will want to plant it in a group. Plants that are more than 6 feet wide or tall will be big enough to stand alone, in all but the biggest gardens. Usually a large shrub 10 or 15 feet tall is going to make a statement all by itself, and unless you have a lot of space to fill, or want a screen, one in each location will be fine. Smaller shrubs, under 3 or 4 feet tall, will usually be lost in all but the smallest spaces, so they look best planted in groups. The ideal number for groupings is always an odd number – 3, 5, 7, or even more. This allows you to space them more naturally. Remember too that a group should look like a unit, so space the plants a distance about 65% of their final width, so they grow together a little and make a solid mass. Repeating the same plant, alone or in groups, around the garden, is an easy way to create harmony, and tie the garden together. You may not have room for more than one example of a large plant, but medium-sized and small plants can be scattered around, just as we see in nature, where plants are usually numerous at any one location. If you have a few favorite plants, then use them around the garden as your ‘signature’. This will make the garden uniquely your own. Most shrubs are basically rounded – usually a little taller than they are wide. But some have been selected to be narrow and upright, and others low and spreading. Plus, there are shrubs that are pendulous or weeping in habit. Up to a quarter of the area you plant can have unusually shaped plants, but don’t get carried away with this. Too many and you lose their purpose – to emphasize and accent the plants around them. Low, spreading forms are especially useful in the foreground of your beds, but remember when planting them to allow room for their spread, especially if the bed meets a lawn. Otherwise you will find them growing over the grass, and killing it. On the other hand, if you have paved areas, letting low plants spread across the paving is an effective way to soften the stiff, linear edges. That works well at the tops of walls too, where spreading plants will cascade down and soften those hard edges. When you come to place your new shrubs in beds, obviously those that will grow taller should be further back, but don’t make the mistake of planting three rows – tall at the back, medium in the middle, and small in front. Create a more natural arrangement by planting some taller plants near the front, especially if they are narrow accents, and push some lower plantings further back. That is where groups are useful, as a group of low plants can flow inwards in one area, and a group of medium-sized shrubs can flow to the front in another place. This way you will create flow and harmony, and an ever-changing picture in your garden beds. When laying out those shrubs, taking into account when they flower is important. In any season, you want the interest spread around – although in larger gardens it is also possible to make season areas. In these, the focus is on planting for one season, and creating a powerful display. For the rest of the year you use other parts of the garden. In most gardens though, spreading the interest around is the best approach to take. Plants that have both flowers and fruit, or fall color, are very useful in smaller spaces, as they bring interest to more than one season. Scatter the spring flowers around, and do the same for summer ones, and for the fall too. If you have a part of the garden you use most at one season – perhaps the barbeque area for summer – then focus appropriate seasonal planting in that area. 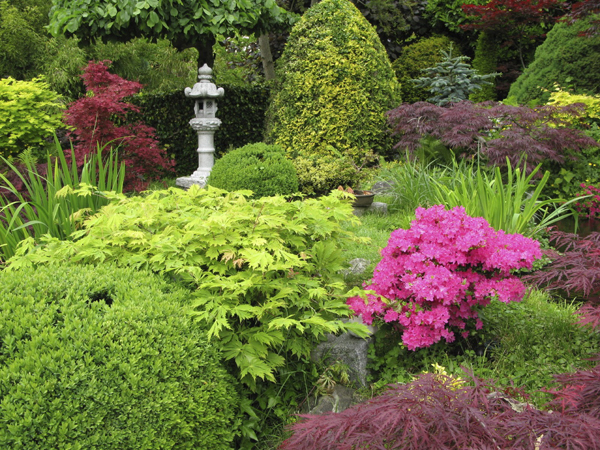 Planting shrubs in your garden is an on-going adventure. Something new is always catching our eye, and we want to use it in our gardens. If you have a good basic layout established, new plants can be slipped in, or used to replace something that hasn’t been a big success, without upsetting the overall look of your garden.